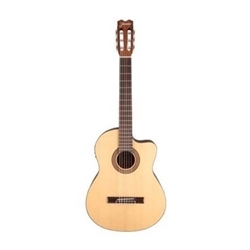 The Jasmine JC-25CE is a full-size acoustic/electric classical guitar that offers a sleek Venetian-style cutaway for easy access to the upper reaches of the fingerboard, and a state-of-the-art electronics system that gives you great amplified sound and performance. Great for any player seeking the sonic virtues of a classical guitar, the JC-25CE features a select spruce top with Jasmine's Advanced Classical Bracing, and sapele back and sides. The slim neck and full 25 1/2" scale length provide comfortable feel and excellent playability, and the onboard Designed by B-Band® preamp system features a built-in digital tuner and four-band EQ for excellent convenience and control.